This is a new bridal set I made recently - WATER LILY . It's inspired by Sarah Coventry's beautiful water lily. 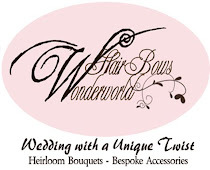 Actually I felt in love with her amazing creations immediately the first time I saw her water lily brooch and it took me quite a while to collect enough of theses brooches and matching earring for these bouquet and boutonniere. The white and gold colours are combined together gracefully and I love that it'd be so easy to match. 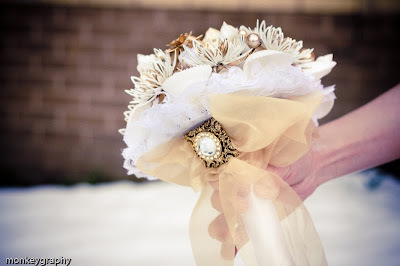 To give the bouquet a brighter look, I added some white cockle and bubble shells and on that beautiful flower cluster shine a huge gold ribbon water lily as a focal point with its center full of white cultured pearls and crystals. 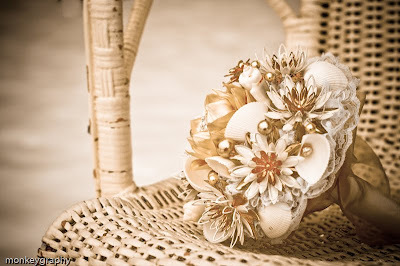 Dreamingly scattered throughout the bouquet are gold glass pearls and gold cultured pearls. The gold tone petals of the water lily brooches and those glass and cultured pearls catch the light superbly they will make the bouquet shimmering beautifully under the sun or under the light when you walk down the aisle. To finish the bouquet off, I wrapped the handle with white satin ribbon, gave it a beautiful white lace backing and add a huge dreamingly sparkling gold sheer ribbon bow with a stunning vintage button in the middle. 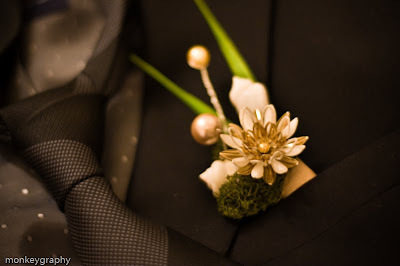 For the groom, I made this boutonniere to match. Again, it's a combination of a Sarah Coventry's water lily earring, two bubble shells and some gold glass pearls. I also added some artificial grass and some dry reindeer moss for a graceful natural look. I was so happy with the material I used to make this set that I started to collect more Sarah Coventry's vintage brooches and earrings. Why I didn't notice her beautiful jewellery before??? If you like this set, you might also want to look out for my soon- realeased- new bouquets made with her 'Summer Magic' and 'Flower Flattery' collection. Yeah! I agree with you there, this is totally gorgeous. Love it. 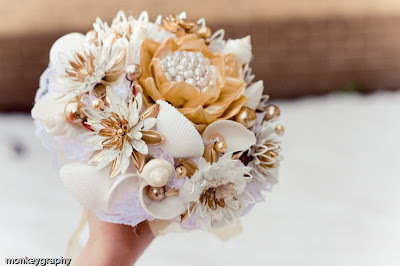 Finally,I found the perfect wedding bouquet that was absolutely elegant,I like it so much. Keep posting guys!